Congratulations fo MFA alumni Thomas Winston, Eric Bendick, Jeff Reed, and Scott Sterling. Their production "Epic Yellowstone: Return of the Predators", one episode in the four-part Epic Yellowstone series, currently showing on the Smithsonian Channel, received the Best Broadcast Feature film award at the International Wildlife film Festival. Johnny Holder, currently a student in the school of Film and Photography’s MFA in Science and Natural History Filmmaking Program, won first place in the Student Category at the Bigfork International Film Festival for his film “Beyond Bars.” MFA student Jess Portuondo won second place in the student category for her film “The Battered Wife.” MFA student Cynthia Matty-Huber’s film “I Am Still Here” was screened at both Bigfork and the Poppy Jasper film Festival in San Jose, California. Congratulations to Tenzin Phuntsog on being awarded the George Stoney Fellow! Congratulations to our SFP faculty Nancy Cornwell for receiving a 2019 College of Arts and Architecture Diversity Fellowship for Expression and Creativity at the Boundaries: Difficult Dialogues about “Expressive” Rights (and Responsibilities?) at the Margins! Congratulations to Cat Dale and Tenzin Phuntsog for receiving the 2019 College of Arts and Architecture Block Grants. Cat Dale's subject will be Rubber and Glue - A Narrative Short Film and Tenzin Phuntsog subject will be - Portraits of Three Montana Poets. Congratulations to Dawson Ahrenstorff on being awarded the Conner Firstman "Film Like a Champion" Scholarship!! Dawson won based on the excellence of his work, his commitment to videography, and he shares Conner's love and passion for the Bobcats and MSU. Congratulations to Ian van Coller, Joy Dietrich, Jim Joyce, and Alexis Pike!! They are the 2018 recipients of the CAA Block Grant and Diversity Fellow from the School of Film and Photography. Congratulations to Alexandrea Brazzle, an undergraduate in our photography program, on winning First Place Student Debut award in the PDN The Look Fashion Photography Competition with a tricolor gum over cyanotype print!! We won an Emmy for best Commercial spot for “My Small Town” featuring Helmville, Montana. In addition, THE VIOLIN ALONE cleaned up, and two of our other alums, Jake Whittenberg, now an anchor for KING 5 in Seattle, and Shawn Newton, who works for the Montana Network, also won. A big night for SFP and MontanaPBS!! Jim Joyce received a scholarship and creativity grant to tell the story of the 10-year-old Lucas struggling to take control of his Mother’s cancer. Lucas panhandles in his Mother’s cancer ward to raise money for a ticket to Japan, where he hopes to be bitten by a radioactive spider. Lucas’s therapist, Constance, fights to balance Lucas’s seeming inability to balance reality and fantasy while make sense of her own mistakes and misgivings. Jim will revise the script through the upcoming academic year and shoot next summer. Congratulations to the following MSU School of Film & Photography 2018 scholarship winners: BABCOCK - Katelyn Trissel, $500; GERBER - Timother Wells, $1000; HUNKE - Isabella Reber, Katelyn Christianson, August Schield, $2500 each; ROE - Nathaniel Wordal, $500; SAYED AHMED - Christina Carey, Nathaniel Wordal, $1000 each; SMITH - Jessica Hays, Nathaniel Wordal, $500 each; SWARTZ - Timothy Wells, $500! Congratulations to IAN VAN COLLER as he has been selected as a 2018 GUGGENHEIM FELLOW!!
" His work has been widely exhibited nationally and internationally and is held in many significant museum collections, including The Philadelphia Museum of Art, The Getty Research Institute, The Metropolitan Museum of Art, The Library of Congress, and The South African National Gallery. Van Coller's first monograph, Interior Relations, was published by Charles Lane Press (New York) in 2011. He is a member of the Piece of Cake collective. Congratulations to Jason Roehrig!! Roehrig, a graduate student in our MFA program, won the top student prize at the Wildlife Conservation Film Festival in New York City with a short documentary about a Nevada rancher Dave Spicer and his efforts to promote the Amargosa toad population. View the "Stewardship with Vision, Ep 5 - David Spicer"
Congratulations to MSU School of Film & Photography Assistant Teaching Professor and alumnus Karl Swingle on being awarded a Humanities Montana grant to fund his documentary, The Camp Poplar Cannon! Congratulations to Hugo Sindelar of our MFA program for winning Best Student/Youth Film at the Boise Film Festival! Congratulations to the 2016 Max and Alice Hunke Scholarship winners Ian Jirasko, Kathryn Murphy, Kira Nuebel, Colter Peterson, and Kellie Swanson! Congratulations to MFA alumni Dawson Dunning and John Shier for winning an Emmy for Outstanding Cinematography Documentary and Long Form for Wild Yellowstone - Frozen Frontier! Congratulations to MFA alumni Roshan Patel for winning the best STUDENT/EMERGING Award at the 2016 Science Media Awards & Summit for his film, "Red Wolf Revival", and Abby Kent for taking a Special Jury Prize for her film, "Transistors: Teeny Tech that Changed the World", narrated by Eliza Lily Goode! Congratulations to Kathy Kasic! As Co-Principal Investigator of Education and Outreach for Collaborative Research: Subglacial Antarctic Lakes Scientific Access (SALSA): Integrated Study of Carbon Cycling in Hydrologically-active Subglacial Environments, Kathy will direct two short documentaries, oversee education and outreach opportunities for the seven institutions, create a web presence, and curate an art gallery and museum installation about subglacial Antarctic science over the grant period from 2016-2019. This grant provides funding for a field season in Antarctica for Kathy in 2017-18 and one graduate student to work on the grant for three years as well as a part-time graphic design undergraduate student.John Priscu is the PI and the other Co-PIs are Mark Skidmore and John Dore. 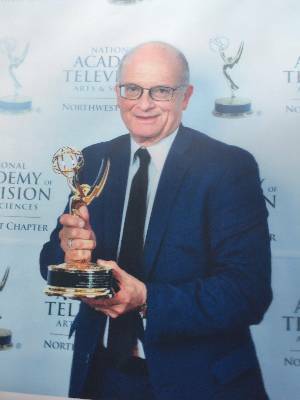 Congratulations to all Emmy Award winners from the state of Montana, including MSU, MSU School of Film & Photography faculty and alumni, and the local TV stations!! Congratulations Art Forward Silver Award winner Cynthia Matty-Huber! A photography alumna and MFA candidate, Huber's photograph was selected out of 800 submissions as a Silver award winner in the category of Art Forward contest #5; “ Show and Sell “. The MSU television ad that featured the team of MSU alumni and faculty who made the mustange documentary, "Unbranded." won a Gold Montana American Advertising Award, ADDY 2016! Congratulations to co-Directors Dennis Aig and Scott Chestnut!! Congratulations to assistant Professor Lucia Ricciardelli for being one of the first awardees of Montana State University’s seed-grant program! The MSU Outreach and Engagement Council launched Montana State's a seed-grant program to promote outreach and engagement activities involving faculty, students and staff in collaboration with local and regional partners. After careful review of all of the proposals, four projects were chosen to receive an award of $5,000 each. Christine Stanton, assistant professor in the Department of Education, and Lucia Ricciardelli, assistant professor in the School of Film and Photography, are collaborating with Blackfeet Community College on "Piikani Digital Storywork," a project that collects digital stories from the Blackfeet tribal community. Through the project, students and faculty at BCC and at Blackfeet Academy high school will learn filmmaking techniques from MSU students and faculty, who, in turn, are engaged in culturally responsive, community-centered filmmaking and education. "Silencing of Thunder," a film produced, directed, and edited by School of Film and Photography MFA graduate Eddie Roqueta won the 2015 College Television Award First Place Winner. "When temperatures drop in Montana, wild bison migrate to lower elevations outside the boundaries of Yellowstone National Park. But once outside, they run the risk of being killed because some carry a chronic disease called brucellosis that ranchers fear could spread to cattle. Silencing the Thunder presents the obstacles ranchers face, as well as the side of those trying to protect one of America’s most iconic animals." Featured on National Geographic's Short Film Showcase: video.nationalgeographic.com/video/short-film-showcase/is-it-ok-to-kill-americas-wild-bison. Dennis Aig's "Unbranded" took home the 2015 Audience Choice Award. The film, directed by Phillip Baribeau and produced by Ben Masters, unfurls an incredible story of adventure and self-discovery while spotlighting the plight of wild horses in America. Best score: Liz Preston, "The Fire And The Rose"
Best sound design: Michael Van, "Orientation"
Best supporting actress: Natalie Griffin, "la violencia en colombia." Best supporting actor: Jacob Fjare, "Insolvency"
Fall Galusha Award: "la violencia en colombia." Spring Galusha Award: "'Tis The Season"
Best makeup & hair: Sarah Jerger, "The Corduroy Man"
Best production design: Sarah Jerger, "The Corduroy Man"
Best writing: Tay O'Neil, "'Tis The Season"
Best cinematography: Zane Clampett, "Clay"
Best editing: Cole Amundson, "la violencia en colombia." Best actress: Claire McCahan, "The Fire and the Rose"
Best actor: Kyle Downs, "The Corduroy Man"
Best Director: Joe Schadt, "The Corduroy Man"
Audience Award: "'Tis The Season"
Best Picture: "la violencia en colombia." Unbranded, a U.S. documentary about four friends on a 3,000-mile journey on horseback by director Phillip Baribeau, has won the audience award at the Hot Docs Canadian International Film Festival. The feature is produced by Masters, Baribeau and Dennis Aig. Congratulations to Annie White!! Her film, "A Wolf's Place" won Best Documentary at the Love Your Shorts Film Festival in Florida and the Beverly Hills Shorts Festival. You can catch "A Wolf's Place" at the following festivals:Vail Film Festival - Vail, CO, March 28, 2015 - 11:15 a.m. and March 29, 2015 - 3:15 p.m.; American Documentary Film Festival - Palm Springs, CA, March 29, 2015 - 2 p.m.and the International Wildlife Film Festival - Missoula, MT, April 18-25, TBA. Congratulations to Ian Vito Bell, a senior in our photography program at Montana State University. He took third place, the highest ranking American, in the SPIE International Year of Lightt photo contest. Congratulations to senior photography student Cynthia Matty - Huber!! Huber's exhibition about John Hoiland has been selected in the top 50 of PHOTOLUCIDA. This is the first time a photography student in our school has been honored in the top 50. Congratulations to MFA alumni Ingrad Pfau and Rob Nelson! Pfau's "Seizing the Unrecorded" won the Best Student/Emerging Science Filmmaker and Nelson's Untamed Science won a Special Jury Award at the Jackson Hole Science Media Awards. Congratulations to Hunke Scholarship Award winners Zachary Gartner, Cynthia Huber, Denver Jones, and Jeremy Gould! Each are awarded $2000. Congratulations to senior film student Jennings Barmore! Jennings placed first and won $10,000 competing against entries submitted from over 40 different countries in the Genero Storyteller category from Genero.tv. Barmore's film is about the great outdoors in his home state of Montana, USA. Congratulations to School of Film and Photography Master of Fine Arts alumna Deia Schlosberg! Her documentary film, Backyard, about fracking and its effects won two Emmy College Television Awards in 2014 in the categories of Documentary and Bricker Humanitarian Award. Congratulations to Roshan Patel!! His film PRIDE won the Best of Festival Short at the 37th International Wildlife Film Festival. Congratulations to School of Film and Photography alumni Charles Dye, Daniel Schmidt, Dawson Dunning, Rick Smith, Christi Cooper, Katie Lose Gilbertson, Andy Adkins, Jaime Jelenchick Jacobsen, Aaron Pruitt, and Scott Sterling on their regionalEmmy nominations!! Roshan Patel wins the Best Wildlife Conservation Film at the New York WILD Film Festival for his film "Pride"! Photography faculty Alexis Pike was awarded a Center for Faculty Excellence Fellowship for being a leader and mentor in the use of technology in teaching and learning. Congratulations Alexis!! SNHF student Devon Riter's film, ART IS WAR was selected for the recently completed Big Sky Documentary Festival and was a finalist for the Big Sky Award at the festival. SNHF student Zuzana Gedeon's film BEATING BATTEN was selected for the LA Women's International Film Festival. Congratulations to Devon and Zuzana!! Congratulations to SNHF student Refah Seyed Mahmoud for receiving an Honorable Mention for the Newcomer Award at the Wild Talk Africa International Film Festival (Durban, South Africa) for his film "Life on Ice"! Congratulations to MFA alumni John Shier, class 2005, Federico Pardo, class 2011, and Dawson Dunning, class 2012! They won the Outstanding Cinematography: Documentary and Long Form EMMY Award for their work on the National Geographic Channel: "Untamed Americas". "Deer Father", directed by alumnus Alex Brinkman won the Audience Choice Award for Narrative Short at the Northwest Filmmakers Festival in Portland. Congratulations to Alex and all the SFP crew!! "The Happy Couple", produced and edited by James B. Joyce is a 2013 Silver Screen Award winner in the Short Film Competition category at the Nevada International Film Festival. Current M.F.A. candidate Mike Suarez collaborated on the sound design. The awards ceremony will be held at 9:00 p.m. on December 7, 2013 in Las Vegas, Nevada. Congratulations Jim and Mike!! Congratulations to Roshan Patel for winning the Best of Fest Award, and to Deia Schlosberg for winning the Audience Award at 2013 Element Film Festival!! The winners of the 2013 Max and Alice Hunke Scholarship are Sam Erickson, Rachel Hardin, Drew Hay, and Danielle Mullens. Congratulations!! Congratulations to all who contribute to Terra!! Terra won the 2013 Webby and the People's Voice in the Green Category. Ingrid Pfau of our MFA program was awarded Runner-up at the 2013 Neuro Film Festival for her film Epilepsy. Pfau won $500 and a trip to the screening at the Neuro Film Festival in San Diego in conjunction with the American Academy of Neurology's 65th Annual Meeting, the world's largest meeting of neurologists. Congratulations Ingrid!! TERRA is the winner of the People's Champ Award in the Green Category of the 2012 Pixel Awards!! We are proud to announce that the College of Arts & Architecture awarded James Joyce, Anjali Sundaram, and Ian Van Coller Research/Creativity Block Grants. Joyce will create, Machinima & Interactive Drama, a documentary that explores the relationship between classic storytelling approaches with modern gaming theory, placing the interview subjects within a video game world. Sundaram's grant will support, Letters from Silicon Valley, a series of video portraits of people living and working on the margins of the high-tech economy in the Silicon Valley. The film examines the underside of the techology boom where IPO offerings and substantial salaries for CEOs and software engineers have overshadowed the fact that the industry has also produced a vast number of low wage, hazardous, unskilled, temporary jobs. These positions are staffed by a largely unseen and unacknowledged army of immigrant workers. Van Coller continues his collaborative research documentary entitled, The Last Glacier , in Glacier National Park and Waterton National Park of Canada. Congratulations to 2012 alumni Jeff Reed and Miguel Alonso Mira on their award winning films at the Montana Cine Film Festival. Jeff Reed's film, Restoring an Icon won in the Best of Category, Student Documentary and Miguel Alonso Mira's film, Salma: Wingless Nomad won in the Best of Category, Student Narrative Fiction. Theo Lipfert's "Solving for X" is awarded the Jury Prize at The Portland (OR) Humanist Film Festival! This feature-length documentary is about the quantitative approach to human rights and the work of Patrick Ball. Former MFA students Monica Pinzon, Jefferson Beck, and Libbey White all worked on the film. Casey Kanode's film, Growing up with Gadgets won the award in the category of Best Nonprofessional at the Jackson Hole Wildlife Film Festival! Current and former MFA student films,Trust Montana wins Best Made in Montana, and Trust Alaska wins Best of Category: Non-Broadcast and Official Selection at the 35th International Wildlife Film Festival! Trust Montana - John Thiebes, a 23-year-old farmer sets out to change the agricultural practices on a worn out patch of prairie in the agricultural heart of Montana. TRUST Alaska - Nelson Kanuk, a 17-year shares his story about how climate change is affecting his community. In this 8-minute film, Nelson explains that the main problem facing the northern parts of the world is that winter is coming later and later. This results in increased erosion due to permafrost melt, increased flooding due to warmer temperatures, and intensified storms because the sea ice forms later in the season and is unable to provide a natural barrier for our coastal communities. This sadly leads to the loss of homes, communities, cultures, and a way of life. Congratulations to James B. Joyce of the School of Film and Photography for being presented with a 2012 MSU Teaching & Learning Award! This Honorable Mention award is given in recognition of James' significant contribution to teaching and learning at Montana State University. James, who enthusiastically teaches Aesthetics of Film Production, Editing, and Advanced Narrative Production, was nominated for this award by his students. As your students say, "You rock Jim!!" School of Film and Photography undergraduates, Matthew Smaglik and Steven Hilton won $20,000 from Montana Pitch the 406. This award was given by the Montana Film Office and is to be used on their next project, entitled "Magpie". "Magpie" is set to be shot late this summer and is currently in the fund-raising process. Congratulations Matt & Steve!! Julia Sable, 34, was honored with the Judge's Choice Award for video in the Labby Multimedia Awards, given by "The Scientist," a magazine devoted to the life sciences. The American Phytopathological Society also recognized the film in 2010 with an honorable mention in a video contest sponsored by its Office of Public Relations and Outreach. Phytopathology is the study of plant diseases. Congratulations to MFA Candidate Deia Schlosberg!! Her film, "Connecting The Gems", will screen at this year's Wild and Scenic Film Festival. The festival takes place from Jan 13-15, 2012, in Nevada City, California. "Connecting The Gems" was created as Deia's 2nd year film in the School of Film and Photography's Science and Natural History MFA Filmmaking program and it was one of the 115 films selected from over 350 entries. Ms. Schlosberg is currently at work on her thesis film. Congratulations to Seth Ring for being awarded $10,000 from the Fred Rogers Memorial Scholarship given by the Academy of Television Arts and Science Foundation! Undergraduate, Katie Ritter attended the award ceremony at the Peter Magrath University Community Engagement Award from the Association of Public and Land-grant Universities for her work with Engineers Without Borders. Montana State University won a prestigious $20,000 award! Congratulations to the following photography students for being awarded the Undergraduate Scholars Program Grant from MSU to fund their summer 2011 projects! Collin Avery, Patrick Bakken, Kayla Bedey, Halli Bischoff, Dan Buettner, Tyler Busby, Gwendolyn Courtney, Megan Dunbar, Joseph Early, Parker Hilton, Heather McKenny, John Schlepp, and Justin Stewart. Collin Avery, a senior in our Photography Program is on fire with recognition of his work. He is a finalist for the Luceo Student Project Awards (winner not yet determined) and his work was chosen for exhibition by Juror Alison Nordstrom (Curator of Photographs, George Eastman House) for PHOTOPLACE OPEN, 2011 at Photoplace Gallery in Middlebury Vermont. Zach Kienitz, 2010 graduate of the School of Film and Photography, was invited to screen his short film, Orbis Minor, at the acclaimed 29th Vancouver International Film Festival. Orbis Minor is a short documentary film that acts as an investigation into the affects of our techno-culture on three generations of Americans. Using coded imagery, atmospheric sound-scapes, and insightful interviews with anonymous members of the Silent, Boomer and Millennial generation, the film creates a transportive meditation that hypothesizes as to how technological interaction and evolution will form the new modern world and its people. "I wished to make a film that could succinctly portray the wildly manic, technologically-transfixed environment that the Millennial Generation has become so enmeshed in,” Kienitz says of his goals for Orbis Minor. “The finished product, I think, works well to illuminate some of the nuances that collectively set this generation drastically apart from generations past." The film started as an independent study with SFP professor Cindy Stillwell; “ I know Zach is really interested in pushing the boundaries of the form with documentary and media in general. The film was really a creative breakthrough for him, so how fantastic that it’s now going on to be recognized at an international film festival,” Stillwell says. Orbis Minor was one of approximately 380 films selected amongst thousands of film submissions from around the world. Kienitz will attend the festival for his screenings on October 3rd and 5th, 2010. Congratulations Zach!! Daniel Schmidt, a student in MFA Science and Natural History Filmmaking program, was awarded a prestigious $2,500 scholarship from the National Academy of Television Arts and Sciences. Current and former students from our program also won awards in the Entertainment category for Terra 407: Montana Fare • Jaime Jelenchick Jacobsen, Producer • Andy Adkins, Series Producer • Daniel Schmidt, Series Producer • Dawson Dunning, Cinematographer • Scott Stebbins, Music Composer • Theo Lipfert, Dennis Aig, Walter Metz & Philip Savoie, Advisors; and Disturbance • Jeremy Roberts, Producer/Cinematographer • Philip Savoie, Advisor. Montana Fare and Disturbancecan be viewed on the Terra. Congratulations to Chris Anderson as article about Chromoskedasic Printing was published in the May/June Photo Technique magazine. Seniors Zach Kienitz and Alex Thomas screened their short doc, Fire in the Garden in the Big Sky competition section of the festival. Fire in the Garden examines thought provoking questions and issues of the American West. As a contested region of often-conflicting practices, an understanding of the West may only be derived from a diverse array of sources. In the end, the question remains: are we a fire in this Edenic space? Kate Lain (MFA '09) and Andrew Sobey (MFA '09) screened their short doc 200 Block in the International Doc Challenge section of the festival. Made in five days in the immediate aftermath of the explosion that destroyed several buildings and took one life in Bozeman, Montana, 200 Block is a documentary meditation on history-in-progress in a small western city. Jason Burlage (BA, 1995) screened his first feature, Mi Chacra, the story of a young Peruvian farmer who strives to create a better life for his son by working both as a porter on the Inca Trail and in the fields of his community. Associate Professor Cindy Stillwell attended the festival and participated in the ITVS pitch session for her new work Mating For Life. Twenty filmmakers (from over fifty submissions) were selected to participate in a live pitch session with Richard Saiz, Senior Program Manager at the Independent Television Service (ITVS). Filmmakers each had five minutes to pitch their projects followed by discussion and feedback from Richard Saiz. Bill Neff attended the 2009 Washougal International Film Festival and returned with a Medallion Award for his and Eric Funk’s short film, Water’s Handle Music, which is a true story about undergraduate Eric and his music mentor composing music in a very strange place. Bill and Eric were helped in this film by former and present students: Colette K. Campbell, producer; Trevor Henry, videographer; Justin Marshall Elias, original score; Jim Barker, Jack-of-all-Trades and editor; and also Mary Neff, craft services. The cast consisted of Nick Andrews, Eric Funk, Greg Young, and Safari Yellow. Congratulations to Jaime Jelenchick for winning a CINE Golden Eagle and two Bronze Tellies awards for her production of "Montana Fare"! "Montana Fare" is a 20 minute film about how Americans decide what food to eat. What is more important: quantity or quality, taste or price? "Montana Fare" examines contemporary food culture in rural Montana through the eyes of two women (farmer/rancher Jenny Sabo (Harrison, MT) and Native American tribal elder Minerva Allen (Lodge Pole, MT on the Ft. Belknap Res)) who try to feed their families while living 50 miles from the nearest grocery store. Congratulations to MFA student, Jeremy Roberts for being awarded a Bronze Telly for "Disturbance" in the Nature/Wildlife category and a Classic Telly for "Atlatl" in the Non-Broadcast Production category. "Disturbance" is not your father’s fire management film. This artistic film explores the complexity of wildfire in the Northern Rockies while showcasing extraordinary footage of fire-dependent species and behind-the-scenes footage of fire command camps. It is simultaneously a political commentary and natural history documentary. View Jeremy's films at http://www.paintbrushfilms.com/reel.html. Congratulations to all our current and former students who have again won multiple honors at the 32nd International Wildlife Film Festival! Congratulations to Sierra Wolff, class of 2007, of Blue Sparks Productions! Her "Going Green" commercial was awarded a Silver Telly. Current undergraduates Brian Johnson and Ryan Browning worked on the production, and Dustin Chiocci, MTA alumnus, worked on the sound design. Volition, a short film from MSU-Bozeman’s School of Film & Photography (formerly, Department of Media & Theatre Arts), has won a prestigious Award of Merit from The Accolade Competition. The Accolade recognizes film, television, and videography professionals who demonstrate exceptional achievement in craft and creativity, and those who produce standout entertainment or contribute to profound social change. The award was given to Robert Toombs, Sydney Hoffner, and Zak Melms’ Junior Fiction Film, Volition, which was aimed at raising consciousness about drunk and distracted driving among teens. Volition features exceptional cinematography by MSU Film student Zak Melms, a classic storyline written by Robert Toombs, and the acting of MSU Film student Jillian Jones as well as members the Montana Actors Studio, a local talent pool that works with Film Students and local filmmakers alike to bring local projects to life. The species of focus are the tuatara, the only remaining member of an order of reptiles that evolved around 220 million years ago, and the sooty shearwater, a seabird that has the longest known migration of any animal on the planet. At Victoria University, he will work with biologists who are actively incorporating Maori knowledge of these species into their research and conservation planning. As a Fulbright fellow and filmmaker, Dawson's goal is to promote cultural involvement in conservation planning in New Zealand and abroad. He also hopes to give lectures pertaining to the use of media for conservation purposes. We are proud to announce that undergraduate Sydney Hoffner's Junior Non Fiction film, The "Saga of Stanley Ketchel", was selected as an Official Pick by the BendFilm Festival 2008 in Bend, Oregon. Her film chronicles the rise of Stanley Ketchel, a Michigan native who started his boxing career in Butte, MT at the age of 16. By age 21, he was the 1906 middleweight boxing champion. Included is a film footage from Ketchel's 1909 fight with Jack Johnson, for the heavyweight title. Congratulations Sydney!! Her documentary "Homefront: United or Divided," produced for Montana PBS, was recently nominated for a regional Emmy in the cultural/historical documentary category. Great News! Vanessa Serrao of the MFA program has been nominated for a prestigious Emmy Award for the series "The Real Dutch" that she produced for Discovery Channel, in the Outstanding Special Class--Short-format Nonfiction Programs category. She is nominated alongside Jay Leno and The History Channel. The series profiled the town of Unalaska/Dutch Harbor on the Aleutian Islands, where the ships from the series "The Deadliest Catch" port. You can experience what the town is really like, meet the people who live in an extreme environment, and learn about a subsistence and small-time commercial fisherman. "Deadliest Catch: Crab Fishing", the nominated episode, is directed and edited by Vanessa. To view a clip of the episode, click on the "Deadliest Catch: Crab Fishing" link, click on the "DUTCH" tab, scroll down the list to find the episode. Congratulations to Rick Smith as he has been awarded a prestigious Metcalf Institute for Marine and Environmental Reporting Fellowship to attend a week-long marine and environmental science workshop at the University of Rhode Island Graduate School of Oceanography! Additionally, his film " Fish and Cow", co-produced with Geoff Stephens, won the Montana Filmmaker award at the International Wildlife Film Festival. Congratulations to MFA student Katy-Robin Magruder (formerly Garton) as her touching documentary "Little Mom Full of Color" took second place at the 29th Annual College Television Emmy Awards. Read more about the film and Katy from the Missoulian.